Posted on December 22, 2016 December 22, 2016 , in Swim Spas. When you invest in a swim spa, you’re investing in the ideal outdoor aquatic center your family and friends will love. A swim spa offers something for everyone, from fitness and athletic training to relaxation and playing in the waves. If you’re preparing to invest in a swim spa, you’ll learn about just what to look for to select the right model in the blog post below. Choosing a swim spa company with an outstanding reputation is extremely important as it will make your life as a swim spa owner much easier. Choose a swim spa from a company that has a good reputation for providing quality maintenance and repairs as well as expert advice. Ideally, look online to read reviews and find out how long the company has been in business. For example, Hydropool, one of the world’s oldest swim spa companies, has been in business for 35 years, 20 of which have been spent manufacturing swim spas. When you want a swim spa that is truly comfortable, you’ll need to choose one that is deep enough for all of your users. It should also have comfortable seats and a massage system with a variety of massage settings. Also be on the lookout for correct jet placement, which will make sure you get a soothing massage after a challenging workout. With so many swim spas on the market, you’ll need to look at several to make sure you choose one with the right features for your lifestyle. 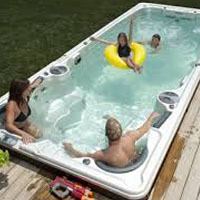 As an example, Hydropool swim spas bring you models that can fit the needs of many different kinds of users. Their Aquaplay swim spa is for users who value enjoyment, playtime, and relaxation. The Aquasport model is designed for athletes and features an adjustable current and many options for in-water exercise and massage. The Aquatrainer swim spa is made especially for elite athletes but also provides the versatility to meet the needs of beginner and mid-level athletes. When you choose an energy efficient swim spa, the savings are incredible. There are several swim spas that are so efficient that you can run them for just a few cents a day. You can enhance energy efficiency by choosing a swim spa with a quality cover, fast filtering speed, and technology that gathers and reuses swim spa heat. When you want to use your time enjoying your swim spa rather than maintaining it, a self-cleaning model is ideal. These swim spas are simple to use and maintain because they will skim, vacuum, and clean themselves for you. No matter what kind of installation style you prefer, you should choose a manufacturer that will allow you to install above ground, in ground, in deck, or indoors. Because everyone’s ideal installation style will be different, the choice should always be yours. To compare swim spas and select the right option for your needs, download our buyer’s guide.